Oklahoma City is a huge city with several district articles that contain information about specific sights, restaurants, and accommodation. Oklahoma City is the capital and principal city of the state of Oklahoma, located in the central Frontier Country region of the state. The sprawling city and its suburbs offer multiple sports venues, museums, regional food, and a mix of Native American and cowboy culture. The central business district, with multiple attractions, restaurants, and entertainment options in the Bricktown, the Plaza theatre district, and other neighborhoods. Oklahoma City Museum of Art, Civics Center Music Hall, Oklahoma City National Memorial, and the Myriad Botanical Gardens. The Museum of Art includes an upscale restaurant and the glass sculpture of Dale Chihuly. On Thursday evenings in the Spring and Fall, the museum opens its rooftop for cocktails and music. The Northeast features the Adventure District, a thriving visitor-friendly area that includes the Oklahoma City Zoo, National Cowboy and Western Heritage Museum, Science Museum Oklahoma, National Softball Hall of Fame and Stadium, and Remington Park Racing & Casino. The Paseo arts district begins at NW 30th & Paseo to NW 27th & Walker. It offers galleries, a sidewalk cafe, two full-service restaurants, and craft shops. Paseo Arts District celebrates "First Friday" each month with an open house and outdoor music. Paseo Arts Festival takes place each Memorial Day weekend with an outdoor carnival and attractions. Including the Capitol Hill Historic District and the Hispanic downtown of Oklahoma City, on the Southside. The stretch of Western Avenue from NW 36th to Britton Road that features locally owned restaurants, bars, retail shopping, and live music venues. The Asia district has the largest Asian population in the state and is also a cultural area. Along Classen Blvd from about 22nd Street to NW 30th. Businesses include the Super Cao Nguyen market, Lido restaurant, and a number of Pho soup kitchens. The 39th Street Enclave is largest LGBT community in the state and a thriving entertainment area with dance clubs and bars and the largest gay resort in the Southwest. Oklahoma City is the largest city in the state, as well as its political, cultural, and economic engine. The city is the nation's third largest city in land area (608 sq miles), just behind Jacksonville, Florida (759 sq miles) and way behind Anchorage, Alaska (1698 sq miles). The city is the 29th largest city in population in the nation (506,132 in the 2000 census), and the largest city in the 5 states on the Great Plains (Oklahoma, Kansas, Nebraska, and North and South Dakota). After decades of suburban sprawl and attempts at "urban renewal", a burst of investment during the 1990s gave it additional big city attractions and a pleasant quality of life that often surprises visitors from other cities, making Oklahoma City more of a tourist destination in itself. 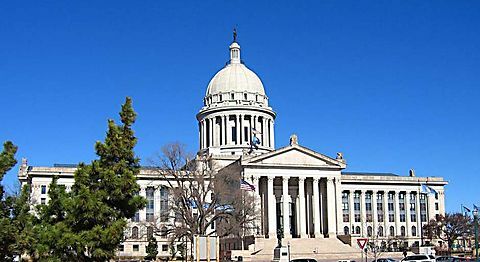 Oklahoma's state capitol building is the only capitol in the world with an oil well under it. Although its legal description is Capitol Site #1, it is referred to as Petunia #1 because it was drilled in the middle of a flower bed. Oklahoma City is in the Frontier Country region of central Oklahoma, in the Southern Plains of North America. Contrary to popular belief, the geography is not flat and treeless (like in the true high plains) but rather gently rolling hills covered in places by dense low trees, shrubs, and grasses. The weather ranges from cold and windy in the winter to hot and windy in the summer, with a chance of flash floods and tornadoes in between. The city is roughly bisected by the North Canadian River, which has been partially renamed the Oklahoma River in a flight of civic exuberance. The North Canadian is not very impressive as rivers go. It was once substantial enough to flood every year, wreaking destruction on surrounding homes, until the 1940s when the Civilian Conservation Corps dammed the river and turned it into essentially a wide ditch for the next 50 years. In the 1990s, as part of the citywide revitalization project known as MAPS, the city built a series of low water dams, returning water to the portion of the river that flows near downtown. The city also has three large lakes. Lake Hefner and Lake Overholser are in the northwestern part of the city. The largest, Lake Stanley Draper, is in the far southeastern corner of the city. 35.393056-97.6008331 Will Rogers World Airport (OKC IATA). This airport offers over 180 flights a day, including non-stop service to over 30 cities such as Los Angeles, Chicago, New York, and Washington, DC. The international airport (built in the 1960s) has completed the first phase of a major expansion and modernization project and is attracting additional non-stop flights to the city. 35.534167-97.6469442 Wiley Post Airport (PWA IATA) (Off Rockwell Ave, between NW 50th and NW 63rd St. About 10 miles north-northwest of Will Rogers. ), e-mail: wpa@okc.gov. Control tower operations, 7AM–10PM. If you want to fly in yourself, this is the place to go. Nine runways handle more than 200 private planes and corporate jets arriving and departing each day. After you land, taxi over to the Oklahoma Museum of Flying in Hangar 24, and then go to the Runway Café in the main terminal for a huge cinnamon roll, or to find out what the lunch special is. Open to the public, including people who arrive by car. Amtrak offers daily service from Fort Worth, Texas via its Heartland Flyer train, which can be boarded at 35.4653-97.51283 Santa Fe Depot, along E.K. Gaylord Blvd between Sheridan Ave and Reno Ave in the Bricktown neighborhood of downtown. The Heartland Flyer has connections to other regional Amtrak lines in Fort Worth. Plans have been proposed to expand the line north to Wichita, KS, and eventually onward to Kansas City. Oklahoma City is at the intersection of two of the nation's longest continuous interstate highways, I-40 and I-35, as well as I-44. It is also on historic Route 66. Greyhound moved the 35.4636-97.479764 Greyhound bus station in downtown Oklahoma City to 1948 E Reno Ave, in the Bricktown neighborhood. Bus service is also provided to the suburbs of Guthrie, Edmond, Norman, Shawnee, Midwest City, El Reno, and the airport. Getting around Oklahoma City is easy by car. If you're coming to OKC, you will likely want to either rent a car or plan on staying around downtown, because public transportation is rather limited. There is pretty good bus service around downtown, to the airport, and to the cluster of museums and attractions in the northeastern part of the city, but if you want to explore the rest of the city without renting a car, you'll either have to use the not-too-stellar parts of bus system or call a cab. A streetcar system operates in dowtown. If you happen to have or rent a car, then getting around OKC is very simple. The streets are laid out in a grid, with named streets running north and south and numbered streets running east and west. The main thing to remember when driving the city is that when you're on the north side, the numbered streets increase from south to north, while on the south side they increase from north to south. (NW 23rd street is a very different place from SW 23rd street, and you don't want to get them confused.) Aside from that minor issue, navigation is a breeze: there are very few one-way street mazes or "Texas Turnarounds" to worry about, and the interstates in town are usually not congested, except during rush hour and construction. Route 050 Downtown Discovery runs from the Oklahoma City National Memorial & Museum to Bricktown, with stops near the downtown transit center, Red Earth Museum, Myriad Gardens and Amtrak station. Many of the attractions are near downtown or on the north side of town. Highlights in downtown are Bricktown, the city's fast growing entertainment district and tourist showpiece, the new Oklahoma City Museum of Art, home to the largest collection of Chihuly glass in the world as well as an arthouse/revival theater and a restaurant, and The Myriad Gardens, an impressive urban park with a 7 story botanical garden. North of the museum is the Oklahoma City National Memorial and Museum. The memorial is both one of the most visible attractions in the city as well as its saddest, which has posed some problems for the city's tourism department. The outdoor symbolic memorial is free and open 24 hours a day, while the very well done Memorial Museum (located in the former Journal Record Building next door) can be visited for a small fee. 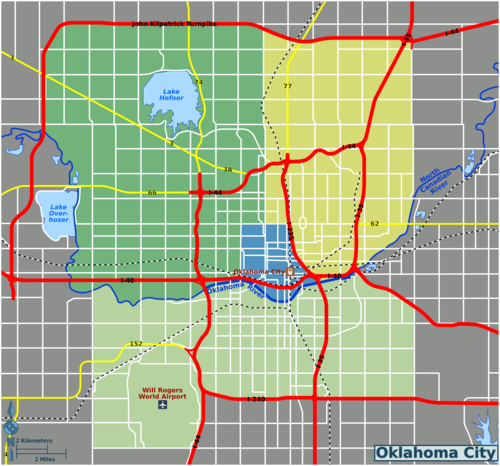 Many of the neighborhoods in the immediate vicinity of Downtown are textbook examples of urban blight, but to the northwest of downtown is a cluster of interesting early 20th century neighborhoods near the campus of Oklahoma City University. The most notable are The Paseo, a ramshackle artist colony in a 1930s-era urban neighborhood, and "Little Saigon" or as it's officially known, Asia District, home to the city's large Vietnamese and East Asian community. The Paseo was built in conscious imitation of Kansas City's Country Club Plaza in the early 20th century, but has since developed a gritty bohemian character that can feel like a breath of fresh air. Dozens of art galleries, restaurants, clothing stores and other related businesses are clustered in the area. The Paseo is actually only a single street lined with Art Deco Spanish revival buildings, but theme had been applied to much of the surrounding neighborhood, including a stretch of storefronts on NW 23rd street, sort of the main street of the Northwest side. West of the Paseo along Classen Boulevard is the Asia District, home to the city's majority Vietnamese Asian community. After the fall of Saigon in 1976, one of the cities picked by the US government for the relocation of refugees was Oklahoma City. Since then, these refugees have been joined by later immigrants from Vietnam and other southeast Asian nations, and by Vietnamese Americans from elsewhere in the country. The district is home to many great restaurants, and to Super Cao Nguyen Supermarket, the largest Asian market in the state. North of the capitol is the Adventure District with the highly ranked Oklahoma City Zoo, the National Cowboy and Western Heritage Museum, and the Kirkpatrick Center (which features a children's science museum, an air and space museum, a photography museum and more), Remington Park and Casino a thoroughbred and quarter horse racing track with a Casino and off-track betting. The Southside is notable primarily for Capitol Hill, a large Hispanic district, and the Stockyards, a neighborhood built around one of the largest cattle markets in the world. Cattle are still bought and sold there every Monday morning, much to the dismay of PETA and other local activists who can sometimes be spotted protesting nearby. The Stockyards resembles in some ways a Wild West-themed amusement park, sans rides. There are stores selling just about anything western themed that you could imagine, from saddles to belt buckles to truly giant hats. One of the few places in the city where your newly purchased giant hat will go mostly unremarked upon is the venerable Cattleman's Steakhouse, which has been serving up hearty steaks and lamb fries (a polite term for fried bull testicles) for over a century. Edward L. Gaylord - Boone Pickens Oklahoma Heritage Museum, 1400 Classen Dr (Corner of NW 13th Street and Shartel Avenue), ☎ +1 405 235-4458, e-mail: ep@oklahomaheritage.com. Harn Homestead Museum, 1721 N Lincoln, ☎ +1 405 235-4058, e-mail: info@harnhomestead.com. International Photography Hall of Fame & Museum, 2100 NE 52nd St (Inside Science Museum Oklahoma, 2nd Floor), ☎ +1 405 424-4055, e-mail: info@iphf.org. Myriad Botanical Gardens, 301 W Reno, ☎ +1 405 297-3995, e-mail: jennifer.coonpeterson@okc.gov. Stockyards City, 1305 S Agnew Ave, ☎ +1 405 235-7267. Canterbury Choral Society, ☎ +1 405 232-SING (7464), e-mail: sing@canterburyokc.com. Lyric Theatre of Oklahoma (professional theatre company,), 1727 NW 16th St, ☎ +1 405 524-9312. Oklahoma Opry (traditional country and gospel shows. ), 404 W Commerce St, ☎ +1 405 632-8322, e-mail: oklahomaopry@hotmail.com. Oklahoma Shakespeare in the Park, ☎ +1 405 235-3700, e-mail: info@oklahomashakespeare.com. Cox Convention Center, 1 Myriad Gardens, ☎ +1 405 602-8500, e-mail: info@coxconventioncenter.com. Chesapeake Energy Arena (formerly Ford Center and Oklahoma City Arena), 100 W Reno, ☎ +1 405 602-8500. Oklahoma City National Memorial and Museum, 620 N. Harvey St, ☎ +1 405 235-3313. M-Sa 9AM-6PM, Su 1PM-6PM, but the last ticket is sold at 5PM. The outdoor memorial is open 24 hours a day, every day of the year and security is always on-site. A three-acre site memorializing the 1995 bombing of the Alfred F. Murrah Federal Building--the most devastating act of terrorism on US soil until September 11, 2001--the memorial includes the remnants of the federal building, as well as a reflecting pool, a collection of 168 hand-cast bronze chairs (one for each person who died in the blast), and the Survivor Tree, a 100-year-old American elm that survived the blast. Admission to the outdoor memorial is free. The museum, which boasts an impressive collection of artifacts pertaining to the Murrah building site, the bombing, and the investigation and recovery efforts. Blue Sage Studios - Glass Works and Gallery, 1218-C N Western Ave, ☎ +1 405-473-0754. Glassblowing demonstrations and more. Museum of Osteology, 10301 S Sunnylane Rd (Located in Oklahoma City south of I-240), ☎ +1 405 814-0006, e-mail: Education@museumofosteology.org. M-F 8AM-5PM; Sa 11AM-5PM; Su 1PM-5PM. The Museum of Osteology displays over 300 real animal skulls and skeletons! $5 Adults, children three and under are free. Orr Family Farm, 14200 S. Western, ☎ +1 405 799-FARM (3276), e-mail: info@orrfamilyfarm.com. White Water Bay (Water Park), 3908 W Reno, ☎ +1 405 943-9687, e-mail: info@frontiercity.com. Summer months only. American Banjo Museum, 9 East Sheridan, ☎ +1 405-604-2793. M-Sa 11AM-6PM; Su noon-5PM. The American Banjo Museum's interpretive exhibits tell the history of the banjo which included its African roots, jazz era, Bluegrass, and folk. The American Banjo Museum houses one of the largest collections of banjos on public display anywhere in the world. $6 Adults. Reduxion Theatre Company, 3000 General Pershing Blvd (City Arts Center at Fair Park), ☎ +1 405-651-3191. Classical and contemporary theater company. Ninety-Nines Museum of Women Pilots, 4300 Amelia Earhart Ln, ☎ +1 405 685-9990, e-mail: museum@ninety-nines.org. Oklahoma City Museum of Art, 415 Couch Dr, ☎ +1 405 236-3100, e-mail: info@okcmoa.com. Oklahoma History Center, 2401 N. Laird Ave, ☎ +1 405 522-5248, e-mail: OKHC@OKHistory.org. Oklahoma Railway Museum, 3400 NE Grand Blvd, ☎ +1 405 424-8222, e-mail: contact@oklahomarailwaymuseum.org. Red Earth Museum, 2100 NE 52nd St (Located inside Science Museum Oklahoma, 2nd Floor), ☎ +1 405 427-5228, e-mail: info@redearth.org. Nona Jean Hulsey Gallery, Norick Art Center, Oklahoma City University, 2501 N Blackwelder, ☎ +1 405 208-5230. M-F 10AM-4PM; Su 2PM-5PM. Art gallery on the campus of Oklahoma City University. See website for current exhibitions. Free. Oklahoma City Dodgers, 2 S. Mickey Mantle Dr, ☎ +1 405-218-1000. The local Triple-A Pacific Coast League minor league baseball team plays at 35.464961-97.508053 Chickasaw Bricktown Ballpark. $8-24. The Colonial Art Gallery and Co., 1336 NW 1st St. Open since 1919, Colonial is a full-service gallery, buying and selling investment-quality artwork, as well as framing, restoring, and appraising art. Size Records, 8915 N Western. Oklahoma City's best independent record store. Bohemian Spirit Vintage, 913 W. Britton Rd, ☎ +1 405-885-5994. Generally open W & Th 11AM-7PM; F & Sa 1PM-6PM. Miss Amy provides locals with vintage wearables and wares and art. 1900s-1980s. The Learning Tree. Toy store offering lots of educational toys. Jo Ann's Classic Consignment. Great clothing and accessories. Say Hi to Jo Ann! This article or section does not match our manual of style or needs other editing. Plunge forward with these suggested fixes: Wikivoyage articles are not meant to be yellow page directories, and "Eat" sections are usually divided by price range (budget, mid-range, splurge) rather than cuisine type. Please ensure that restaurants that are listed provide a description that will allow users to understand what is special about the establishment. See Wikivoyage:Listings#Eat for site guidelines. Grand House, 2701 N. Classen. A classy and authentic Chinese restaurant in the heart of the Asia District. Features Dim Sum on the weekends. Royal Bavaria, 3401 S. Sooner Rd. Unique atmosphere, with large, shared tables and live Bavarian music. Tandoor Indian Cuisine & Indian Grocery, 1901 E Reno Ave (JRS Travel Center MLK Ave and I-40), ☎ +1 405-270-0379. Tacos San Pedro, 2301 SW 44th. This is real Mexican food, not Taco Bell. Ted's Cafe Escondito, 2836 NW 68th St (just off N. May Ave.), ☎ +1 405 848-8337. You may have to wait to get into Ted's, but it is worth the wait. Some of the best Mexican food in Oklahoma City. Fish & Pies, 1309 NE 23rd St. Great family-owned place. "Last call" is 2AM in Oklahoma City and its environs. Also, until new alcohol laws take effect in October 2018, strong beer (i.e., greater than 3.2% alcohol by weight, or 4.0% by volume) and wine can only be purchased in liquor stores, and liquor stores are open M-Sa 10AM to 9PM (closed every Sunday and every major holiday, such as Christmas, New Year's Day, Memorial Day, July 4th, Labor Day, and Thanksgiving). Also, by state law, all alcoholic beverages sold for off-premises consumption, except for "3.2 beer", must be sold at room temperature. Wine cannot be purchased in grocery stores or convenience stores, so if you need wine, strong beer, or hard liquor you must purchase it before 9PM or you will be out of luck (at least until October 2018 for beer and wine). On the plus side, Oklahoma's prices for spirits and wine tend to be lower than that of nearby states, including Texas. From October 2018 forward, any establishment with a license to sell alcohol for off-premises consumption will be allowed to sell beer of up to 9.0% alcohol by volume, plus wine, under refrigeration. This includes supermarkets and convenience stores. TapWerks Ale House & Cafe, 121 E Sheridan Ave, ☎ +1 405 319-9599. 5 stars. Want to try a new drink or an unsual beer, this is the place for you. Cuppies & Joe, 727 NW 23rd. Tu-Th noon-9PM, F Sa noon-11PM. Great coffee and tons of cupcakes. Oklahoma City Convention and Visitors Bureau, 189 W. Sheridan, ☎ +1 405-297-8912, toll-free: +1-800-225-5652, e-mail: okccvb@okccvb.org. Oklahoma City Chamber of Commerce, 123 Park Avenue., ☎ +1 405-297-8900. A little bit of common sense goes a long way. On the whole, the city is quite safe, but you shouldn't take that as a cue to be careless. If you're downtown or in what looks like a sketchy neighborhood, nothing will probably happen to you, but you should still lock your car door, keep your valuables secure, and not put yourself in potentially dangerous situations. Some of the worst areas are in the inner-city districts just surrounding downtown, particularly parts of Mulligan Flats (SE-SW 15th Between I-35 and Western), NE 23rd St., NE 36th Street, Martin Luther King Boulevard, NW 10th Street, South Central Avenue, South Shields Boulevard, and South Robinson Avenue; you might want to avoid being there especially after it gets dark. Also steer clear of particularly seedy-looking bars, although not all are created equal. Keep your wits about you and you'll be fine almost anywhere in Oklahoma City. You might want to check the Tornado safety page if you are visiting Oklahoma City, as it sits in the heart of "Tornado Alley", but the local media are always all over any developing severe weather. Peak tornado season is in the spring, with April and May being the months with the most severe storms. Summertime heat is also a concern, as average high temperatures during July and August are typically in the mid 90s °F though humidity levels are usually not as high as parts of the adjacent deep south. Temperatures over 100 °F are also very common during the summer months, but all businesses are air conditioned, as well as hotel rooms and other public places. While snow is not uncommon in the winter, it typically falls only a few times and in small amounts, but just a few inches of snow can be enough to cause much more havoc than in more northern locations... drive safely! Germany (Honorary), 5801 N Broadway Ste 120, ☎ +1 405 842-0100, fax: +1 405 848-8248, e-mail: lcraft@wigginprop.com. Norman Is a short drive south of downtown Oklahoma City is its largest suburb and the home of University of Oklahoma. The university is the primary attraction in Norman, with a beautifully landscaped Victorian campus and several fine museums, including the Sam Noble Museum of Natural History and the Fred Jones Jr. Museum of Art. Norman is also significant for its leading role in meteorology (Doppler radar, the basis of modern weather prediction was invented there) as evidenced by the National Weather Center, which offers tours. North of the university is Campus Corner, a dense conglomeration of bars, music venues, restaurants, and retail catering to the college crowd. For those with less disposable income, cheaper bars, music venues, restaurants and retail can be found further north in Norman's small Downtown Core along Main Street. Edmond Is a rather affluent suburb due North of Oklahoma City. It has some great qualities, including nice restaurants, the third largest university in the state University of Central Oklahoma and some quaint, quiet neighborhoods near its uniquely successful downtown business district. This city travel guide to Oklahoma City is a usable article. It has information on how to get there and on restaurants and hotels. An adventurous person could use this article, but please feel free to improve it by editing the page.